An important species of grain which grows chiefly in sandy regions. In Arabia, Italy, and elsewhere a bread, excellent when fresh, is made of it, and also of the species Panicum italicum Linn. The grain is mentioned but once in the Bible, in Ezek. iv. 9: "Take thou also unto thee wheat, and barley, and beans, and lentils, and millet, andfitches, and put them in one vessel, and make thee bread thereof." Since this passage was evidently intended to enumerate all the kinds of grain used for making bread, millet ("doḥan") was included; but it is practically impossible to decide which variety the prophet meant. Rosenmüller and others preferred to translate "doḥan" by "Indian millet," because the Arabic "dukhn" was shown by Forskål to have this meaning, although Furrer had already pointed out that panicum likewise bears the same name; it is best to translate "doḥan" by "millet," especially if the Biblical "sorah" be rendered "sorghum" (Isa. xxviii. 25, A. V., "wheat"; with which Sachau compares the [i.e., "durrah" = "broom-corn"] of an inscription at Zenjirli; comp. 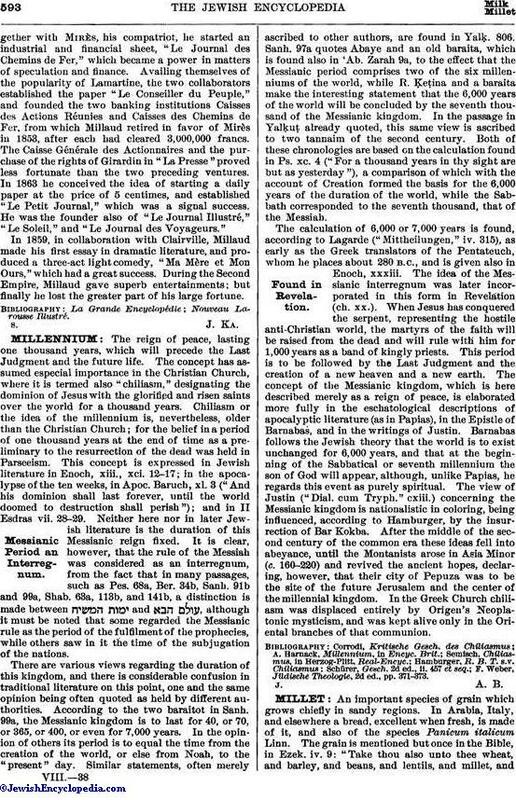 Post, "Flora of Syria, Palestine, and Sinai," p. 854, Beirut, 1896), and to use "panicum" as a translation of "pereg," which is first found in the Mishnah. The Syrians, misled by their word "peragga," have traced this Mishnaic word to the "pannag" of Ezek. xxvii. 17. The Septuagint and the Vulgate, followed by the English versions, incorrectly translate "nisman" (Isa. xxviii. 25) by "millet." In Mishnaic times millet of two kinds, rice, and sesame constituted a separate category of cultivated plants, which were grouped between grain and pulse, although rice and millet more closely approached the former (Löw, "Pflanzennamen," p. 102; Sheb. ii. 7; Yer. Sheb. 34a, 10; Sifra, Behar, 105c; R. H. 13b; Ḥal. i. 4; Mek., Bo, 8b, 12; 9a, 27; Sifre, i. 110, 146; ii. 105; Yer. Peah i. 16c, 23; Mek., Deut. i. 14; Hoffmann). Dioscorides discusses the four kinds of plants in the same sequence. In spite of the fact that rice and millet are kinds of grain, they were not included among the recognized species ('Er. 81a; Pes. 35a; Ber. 37a; "Halakot Gedolot," ed. Hildesheimer, p. 54; Maimonides, "Yad," Berakot, v. 10; "Kesef Mishne," ad loc.). 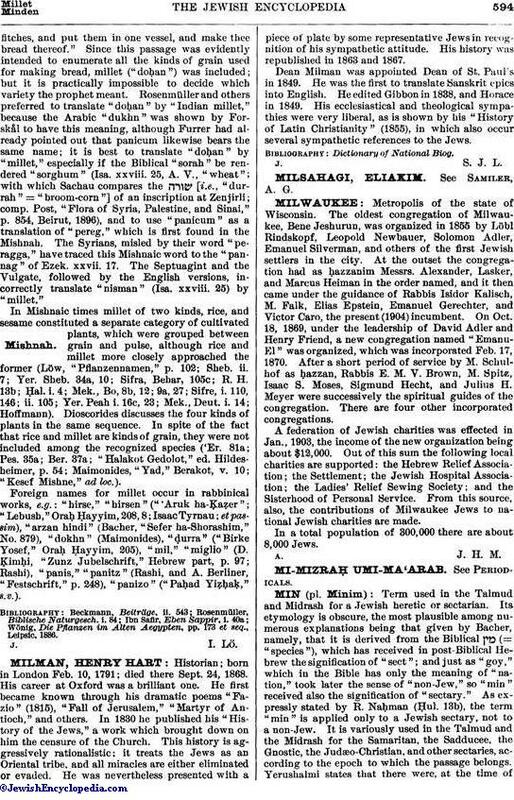 Foreign names for millet occur in rabbinical works, e.g. : "hirse," "hirsen" ("'Aruk ha-Ḳaẓer"; "Lebush," Oraḥ Ḥayyim, 208, 8; Isaac Tyrnau; et passim), "arzan hindi" (Bacher, "Sefer ha-Shorashim," No. 879), "dokhn" (Maimonides), "ḍurra" ("Birke Yosef," Oraḥ Ḥayyim, 205), "mil," "miglio" (D. Ḳimḥi, "Zunz Jubelschrift," Hebrew part, p. 97; Rashi), "panis," "panitz" (Rashi, and A. Berliner, "Festschrift," p. 248), "panizo" ("Paḥad Yiẓḥaḳ," s.v.). Wönig, Die Pflanzen im Alten Aegypten, pp. 173 et seq., Leipsic, 1886.